An overview of all the osteoporosis risk factors. As a woman you have a 1-in-3 chance of developing osteoporosis. However, the good news is that it is preventable and it’s treatable. The trouble with osteoporosis is that it is a silent disease. Most women do not know that they have it until they break a bone or have a bone density test. Smoking and alcohol use. Smoking is one of the major risk factors of osteoporosis. Dietary factors: Nutritional deficiency, excessive consumption of salt, sugar, processed food, soft drinks, caffeine, high protein diets and processed foods. Excessive consumption of overcooked animal protein. If you have a family history of decreased bone density you may be at risk if either both or one of your parents has been diagnosed with osteoporosis, or you have an older sister with it. Your risk may be higher if they developed the disease early in life. Remember that bone density tests are recent so your parents might not have been aware that they had osteoporosis. Did they fracture a bone, had they lost height? Did they have a hunched over posture or chronic back pain? The lighter your skin the greater risk you have for developing osteoporosis. Estrogen is vital to bone growth. Estrogen and osteoporosis is discussed at length in osteoporosis causes. Because of missed periods and eating disorders women in their 20s and 30s can get osteoporosis. It is not the norm but it is possible. Athletic women who are actively participating in competitive sports and not menstruating can also increase their osteoporosis risk factors later in life. It can affect women who appear to be in top physical condition. The risk of osteoporosis for all women increases after menopause, but if you went through menopause before age 45 you have less lifetime exposure to estrogen. This also includes women who have had a hysterectomy before age 45. Estrogen helps build bones and suppresses bone loss. A slender build usually has less bone mass, and you are at an additional risk if you are underweight. Very thin women have lower levels of estrogen, less force is applied to the bones, and less caloric intake means fewer beneficial and necessary nutrients are available to the body. If your BMI is under 19 you are underweight. The best way to lose weight is slowly, one pound per week or two. When you lose weight too fast most people lose bone and muscle along with fat. Eating disorders raise osteoporosis risk factors as they normally occur in the teens and twenties when young women are building bones. Those with rheumatoid arthritis have extra activity of the osteocast cells that dissolve bone. The problem is also worsened with the medications taken for this disease. Hyperthyroid produces excess thyroxin which stimulates the osteoclasts to break down bone. The medication for hypothyroid can be detrimental if the dose is too high, raising risk until the dose is regulated. If too much of the PTH (parathyroid hormone) is secreted, osteoblasts break down the bone. Type 1 Diabetes that is poorly controlled can increase risk. Such as food allergies, colitis or Crohn's disease make it harder for the body to absorb calcium, which could raise your osteoporosis risk factors. Medications for fibroid tumors and endometriosis, that have gonadotropin-releasing hormone agonists, such as Lupron. Nelson, E. Miriam, Ph.D. Strong Women, Strong Bones (New York: G.P.Putnam's Sons, 2000) 65-81. Brown, E. Susan, Ph.D. 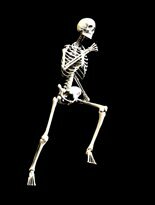 Better Bones, Better Body, Beyond Estrogen and Calcium (Illinois, U.S.: Keats Publishing, 2000) 62-71.